Ingredients: Ricinus Communis (Castor) Seed Oil, Octyldodecanol, Pentaerythrityl Tetraisostearate, Tridecyl Trimellitate, Candelilla Cera/Euphorbia Cerifera (Candelilla) Wax/Cire De Candelilla, Polyethylene, Bis-Diglyceryl Polyacyladipate-2, Polybutene, Peg-4 Diheptanoate, Peg-8 Beeswax, Vp/Hexadecene Copolymer, Ozokerite, Hydrogenated Vegetable Oil, Calcium Aluminum Borosilicate, Cera Alba/Beeswax/Cire D'abeille, Simmondsia Chinensis (Jojoba) Seed Oil, Parfum/Fragrance, Benzyl Benzoate, Synthetic Fluorphlogopite, Silica, Palmitic Acid, Stearic Acid, Stearyl Stearate, Tocopheryl Acetate, Butyrospermum Parkii (Shea) Butter, Propylparaben, Serica Powder/Silk Powder/Poudre De Soie, Retinyl Palmitate, Benzyl Salicylate, Benzyl Cinnamate, Linalool, Tin Oxide, Dimethicone, Cinnamyl Alcohol, Aqua/Water/Eau, Eugenol, [May Contain/Peutcontenir/+/-:Mica, Titanium Dioxide (Ci 77891), Iron Oxides (Ci 77491, Ci 77492, Ci 77499), D&C Red No. 7 Calcium Lake (Ci 15850), FD&C Yellow No. 6 Aluminum Lake (Ci 15985), D&C Red No. 27 Aluminum Lake (Ci 45410), D&C Red No. 30 Lake (Ci 73360), D&C Red No. 33 Aluminum Lake (Ci 17200), D&C Red No. 6 Barium Lake (Ci 15850), FD&C Yellow No.5 Aluminum Lake (Ci 19140)]. With a completely wearable 12 shade colour palette and a bang on price point (let me remind you that this is only $2.19 in the USA) there's a lot going for this lipstick at first glance. But even as they arrived at my door, there was a slight tinge of apprehension. It's been a long time since I've used N.Y.C. products and since been away I've grown into a bit of a lipstick snob to say the least. 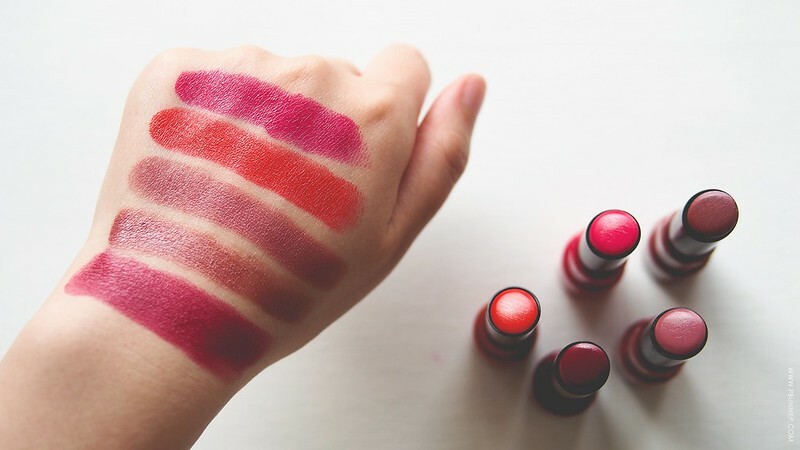 Housed in a simple twist up tube with a clear cap that lets your easily scan the colour you want for the day, these lipsticks are built for functionality. The formula leans on the traditional side with a thicker slightly waxier feel but glides on reasonably smooth with a little extra pressure. It has a sweet lingering scent that hasn't changed with N.Y.C. products since my teenage years but it's not something that bothers me terribly. One swipe will give you medium to near full coverage but a second swipe will definitely have you completely covered. The waxy base means there's little to no sinking into lip lines and the overall application is very forgiving. Of the 12 shades available, most are cream finishes and a few have a fine shimmer but they all impart a pretty sheen that is oh so photogenic! I was pleasantly surprised that these look great on the lips and the effect is on par with some of my higher end products. I would say most of the darker shades apply true to the bullet but a few do turn out slightly brighter then they seem but overall the colour payoff is undeniably vibrant. Every single shade packed a punch and there's certainly enough in the spectrum to suit all skin tones. However if you plan on picking up one of the darker shades, I do suggest using a lip liner to really perfect the edges for a seamless finish - for some reason this lipstick just needed that little extra help. 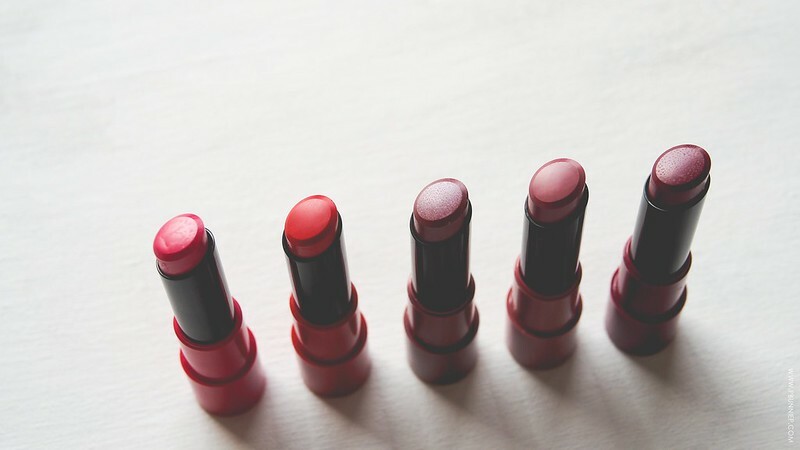 These do kiss off like traditional lipsticks but even then you'll still have plenty of full wattage colour left on your lips. Personally I loved putting these on for quick trips and even for filming because they have great impact on camera. But while they do have a decent wear time of around 3 hours, I find these a little heavy and reapplication isn't as comfortable as I'd like. 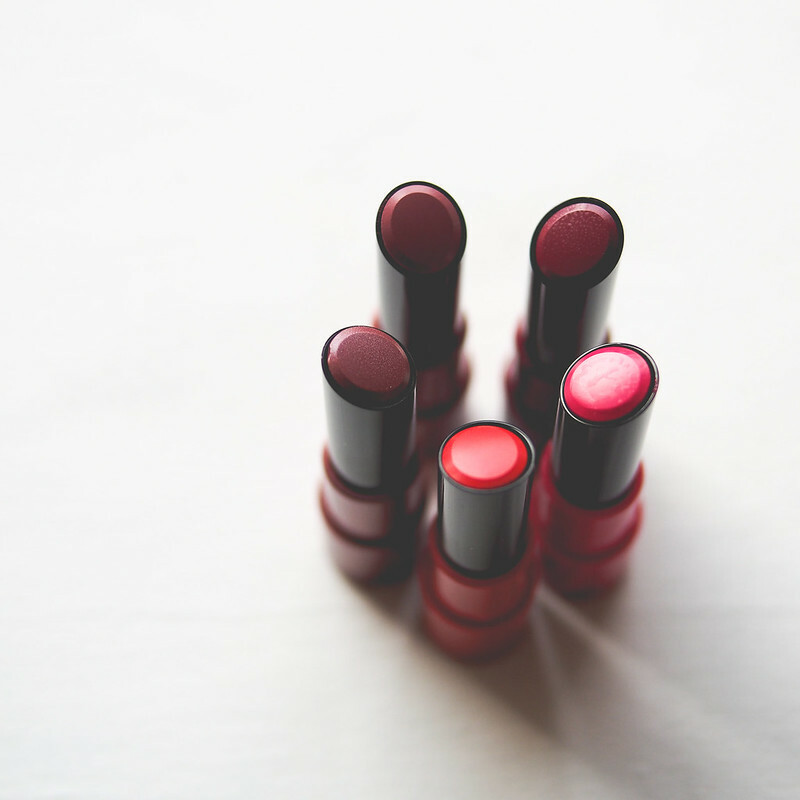 Ideally, you're better off removing the lipstick all together and putting it on again fresh. 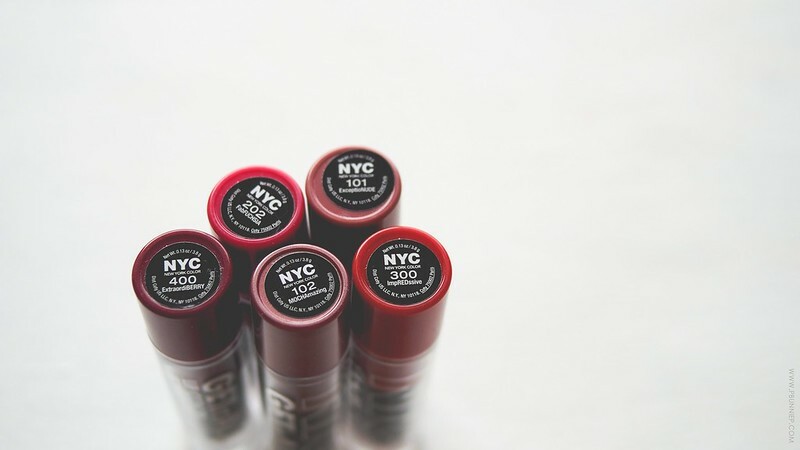 The New York Color Get It All Lipsticks make excellent beginners products and are excellent colour payoff at a drugstore price point. 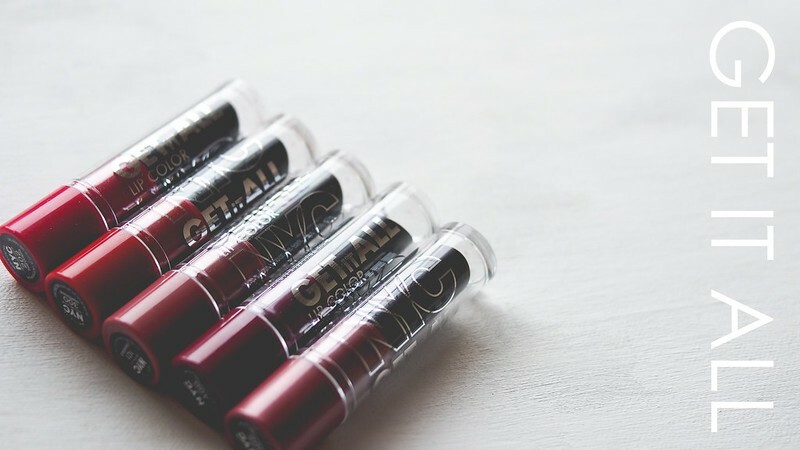 Though not a first choice for dry lips, these can take on a photo-shoot or big event in a pinch and no one would know the difference by how pretty they look. The heart of the N.Y.C. 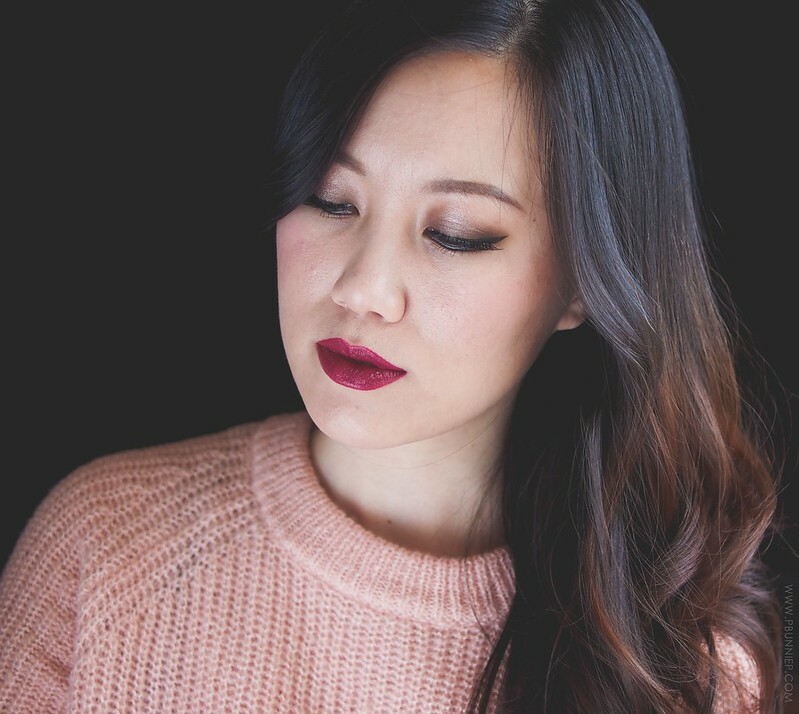 brand has always been young, fun, vibrant and these lipsticks fit right in. Despite them not being perfect, I still find myself reaching for them quite often and I might even pick up a lighter colour or two.